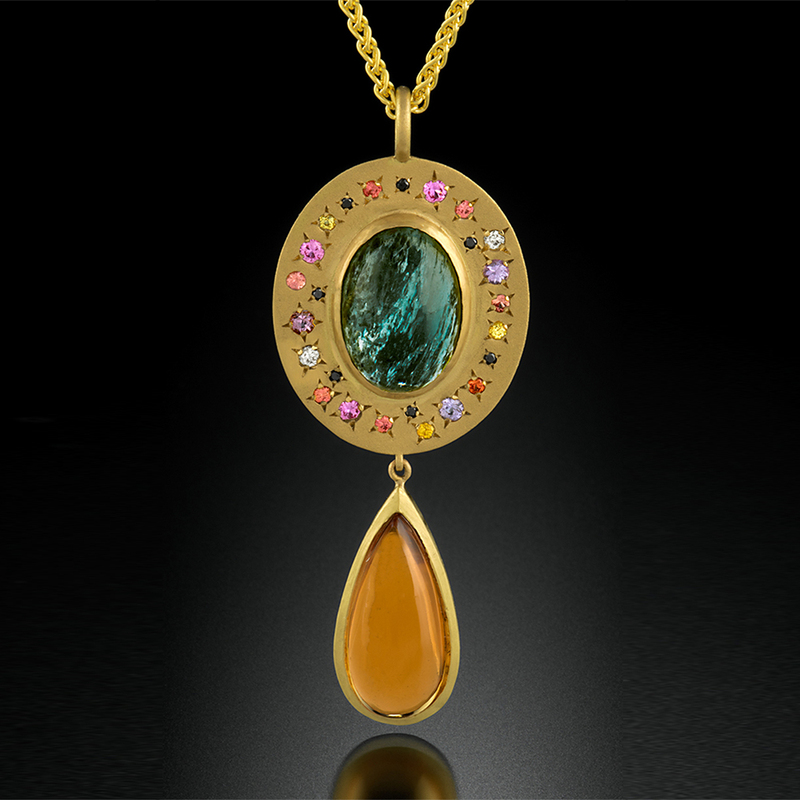 18K brushed yellow gold necklace with a Moonstone surrounded by yellow, orange, pink, purple and blue Sapphires, Tsavorite and Demantoid Garnets and Peridot. 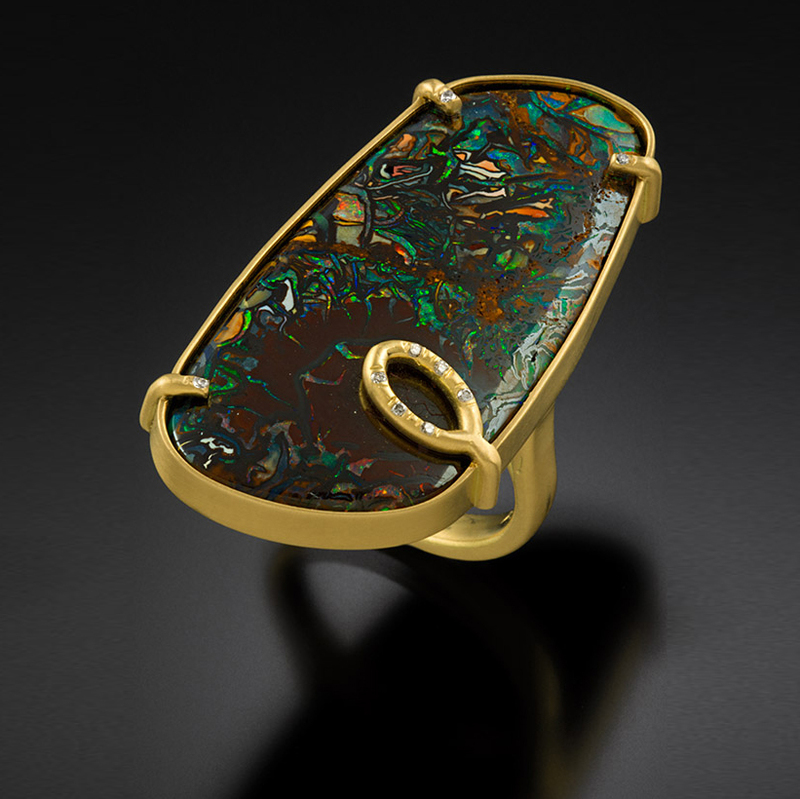 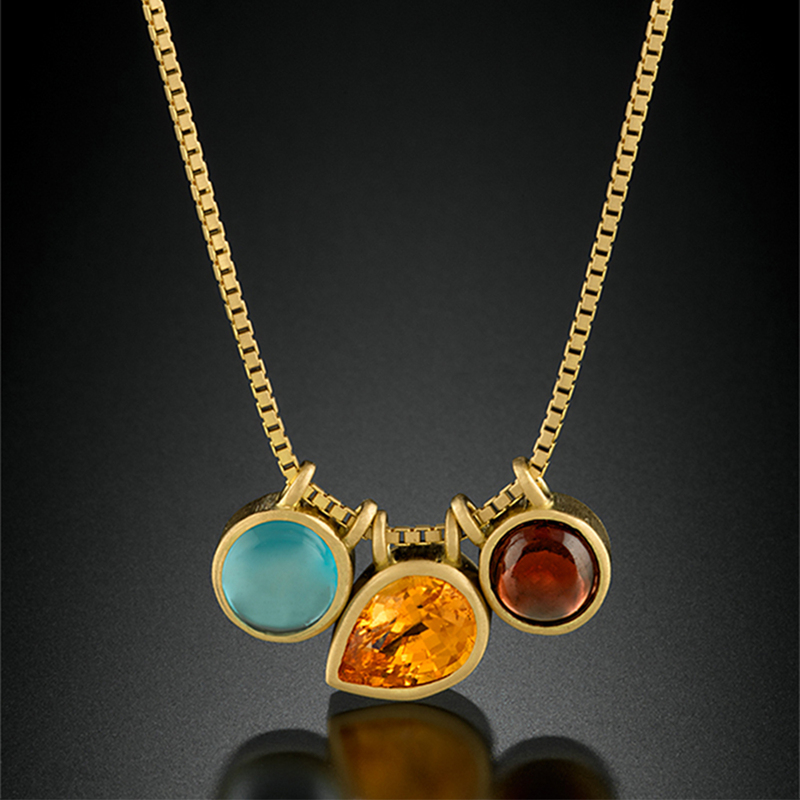 18K brushed yellow gold necklace with a cabochon Ruby, yellow and red Spinels and Tsavorite Garnets (front); blue and orange Sapphires, Amethysts and Peridot (back). 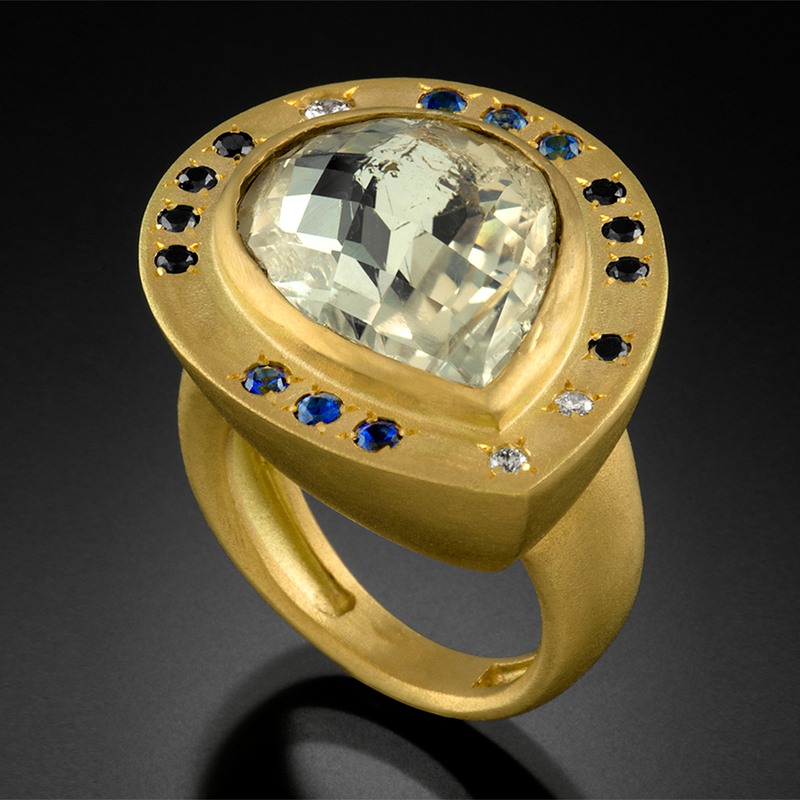 24K yellow gold chain with 18K brushed white gold bezels around 18.80 ct. carved Sapphire, 2.17 tcw rose cut grey Diamonds and a .20 ct colorless round brilliant Diamond. 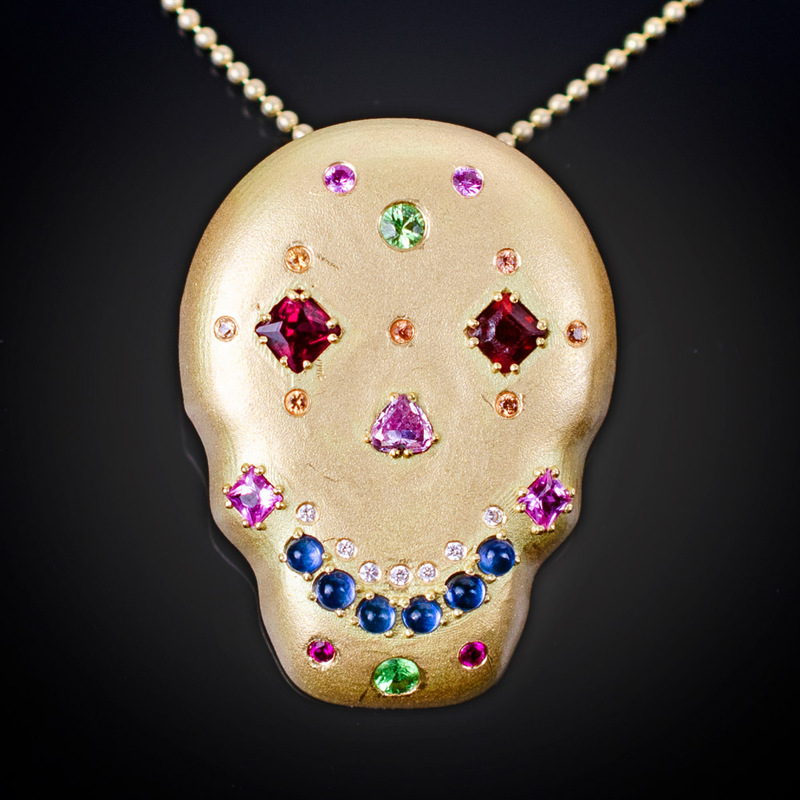 Brushed 18K Sugar Skull pendant and chain with light purple and colorless Diamonds, Rubies, pink, blue and orange Sapphires, Demantoid Garnets and pink Spinels. 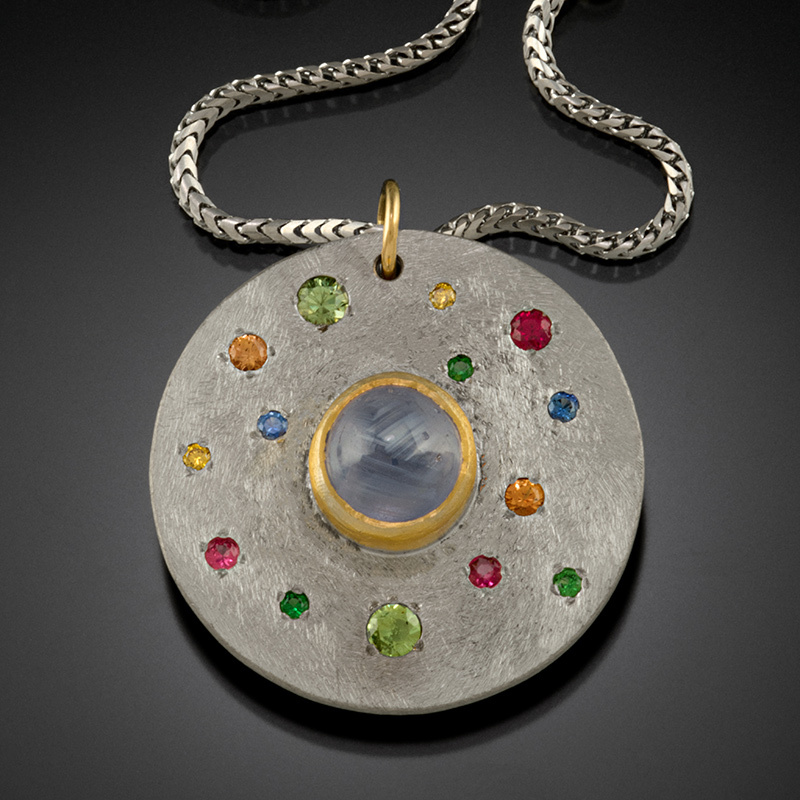 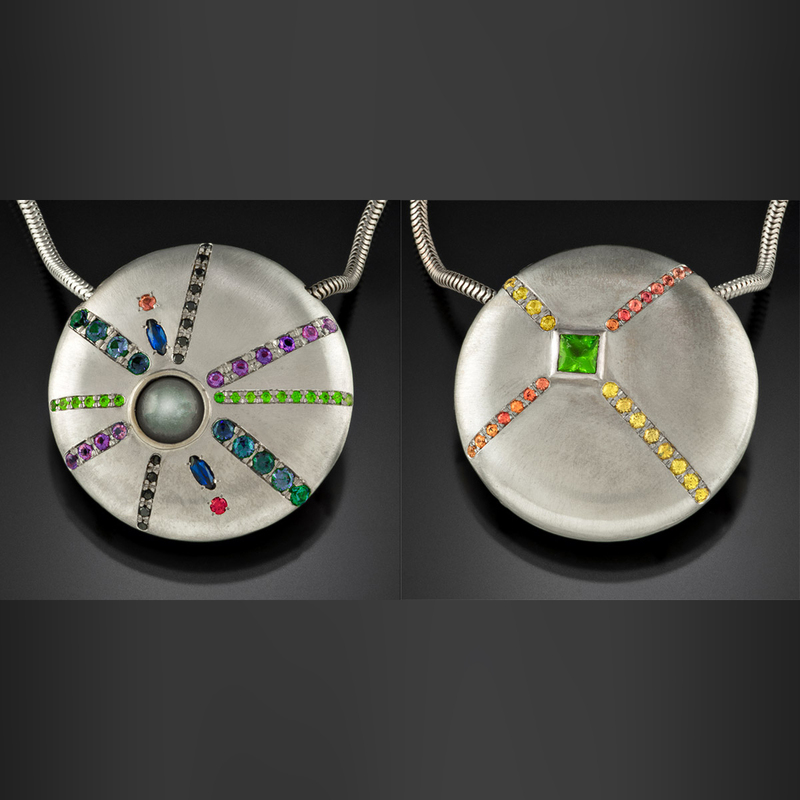 18K brushed white gold necklace with a cabochon grey Moonstone, blue Spinels, orange Sapphires, Tsavorite Garnets, and Amethysts (front); Tsavorite Garnet, yellow and orange Sapphires (back). 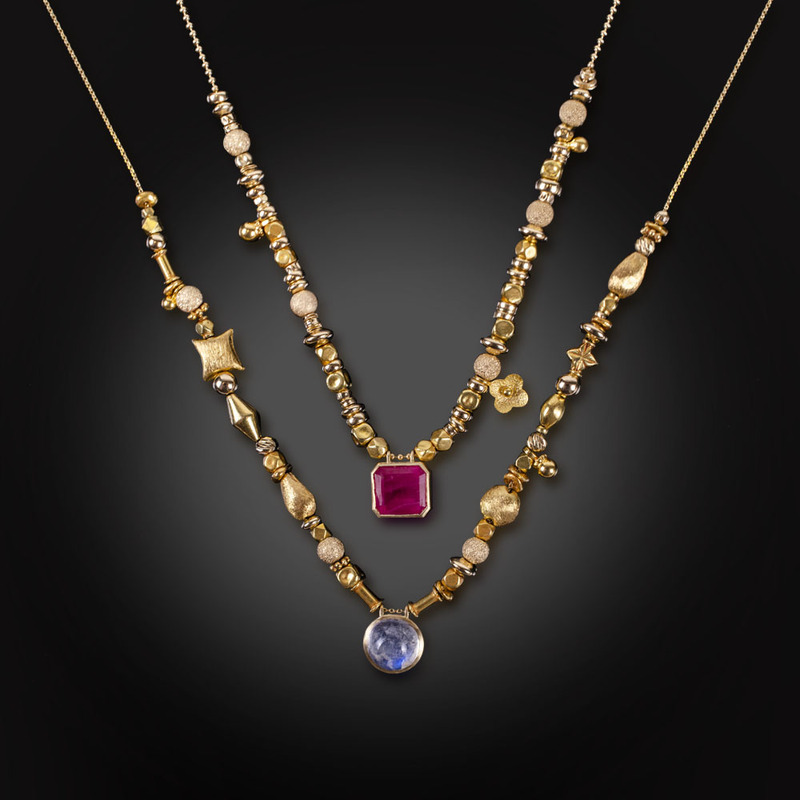 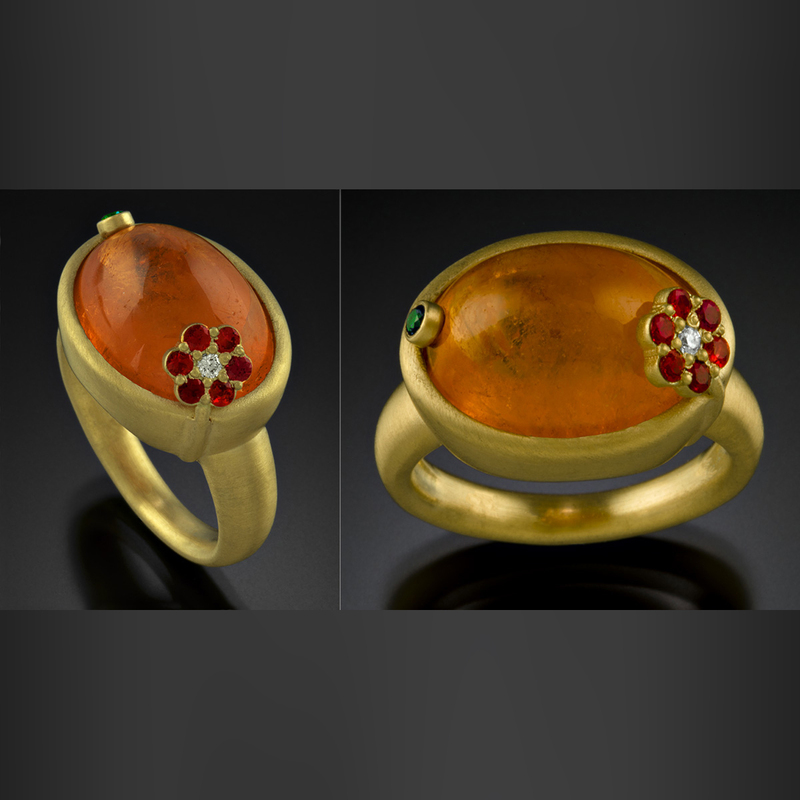 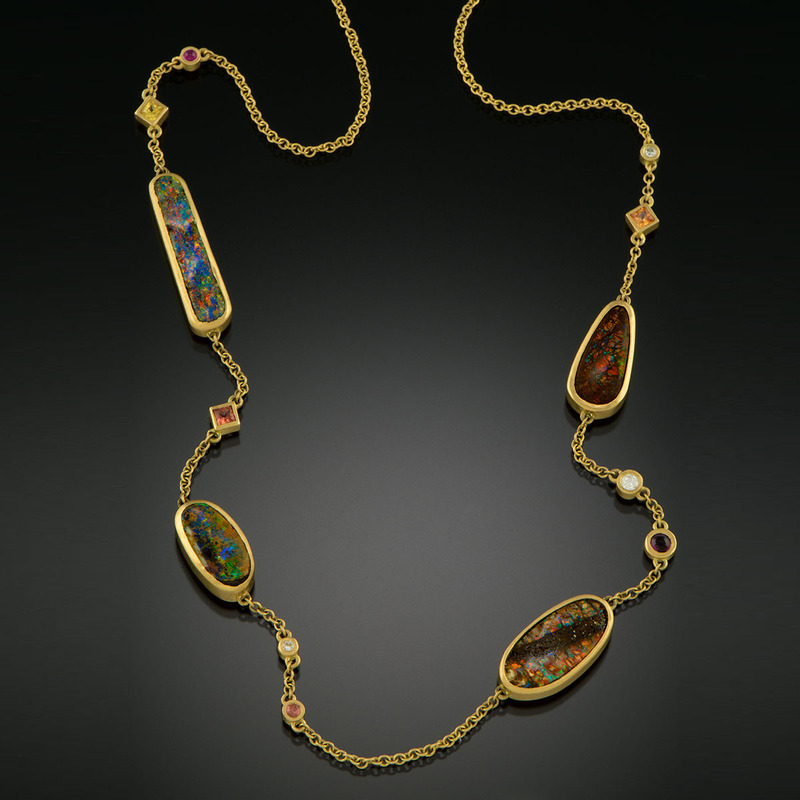 18K brushed yellow gold necklace with Boulder Opals, yellow and orange Sapphires, Diamonds, Ruby and Rhodolite Garnet. 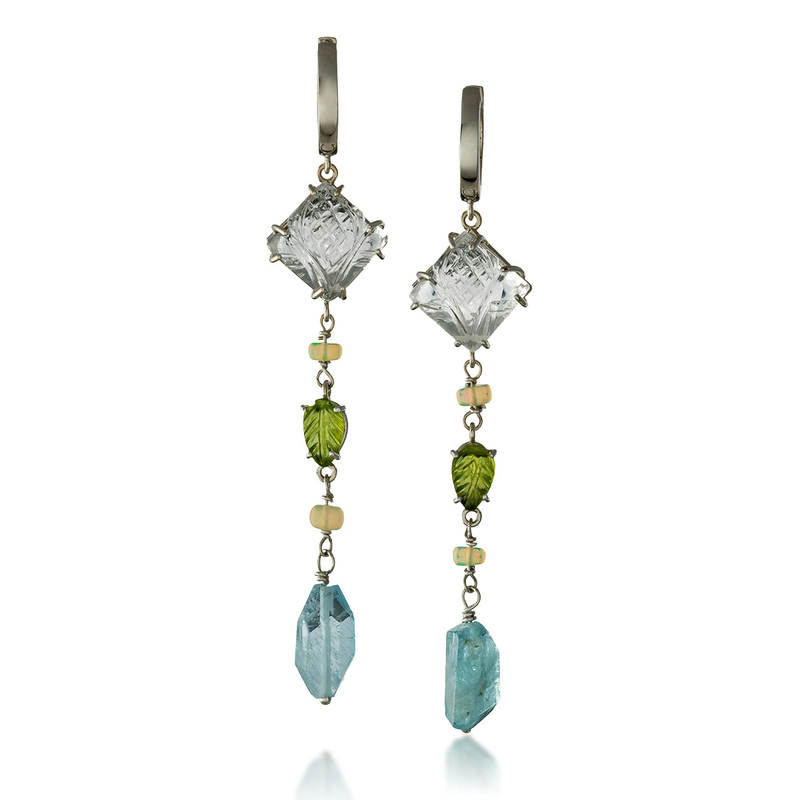 18K Yellow Gold, Aquamarine and light green Tourmaline Dangle Earrings. 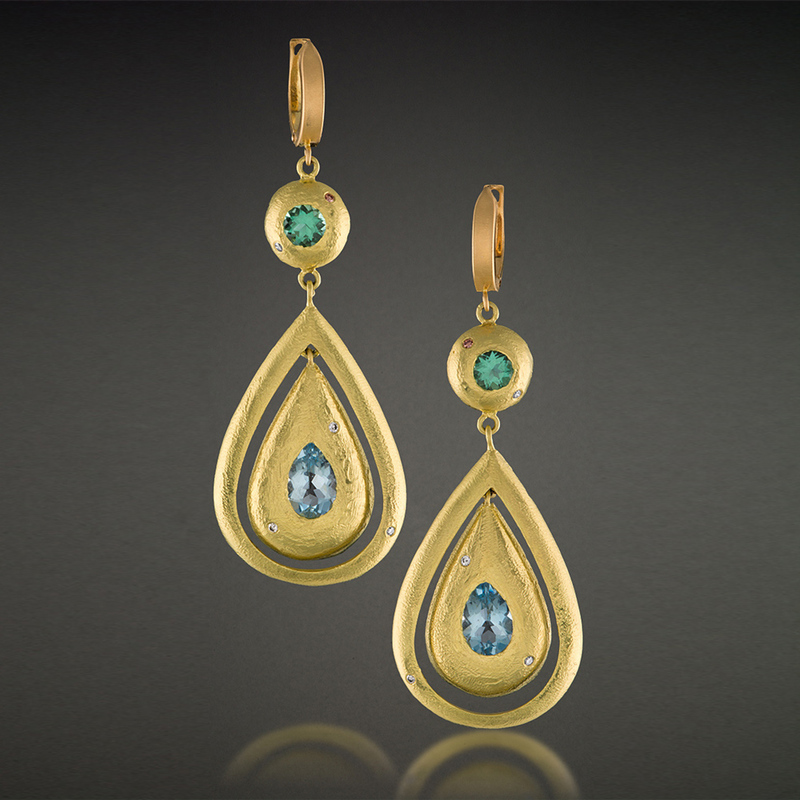 18K brushed and textured yellow gold earrings with flush set pear shaped Aquamarines, light green Tourmalines, grey and champagne Diamonds. 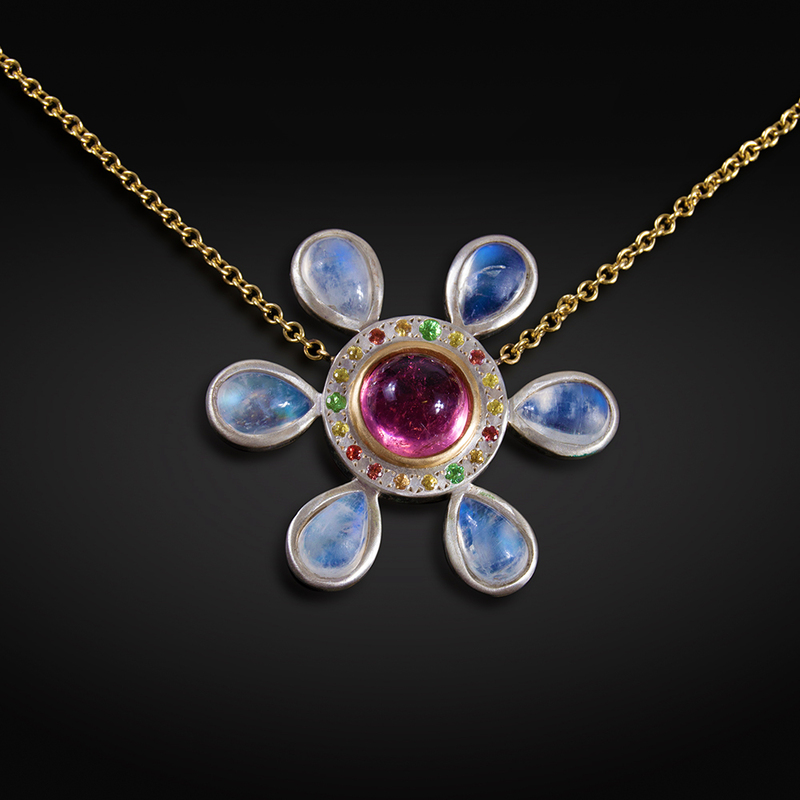 Colorful White Gold Star Sapphire Necklace. 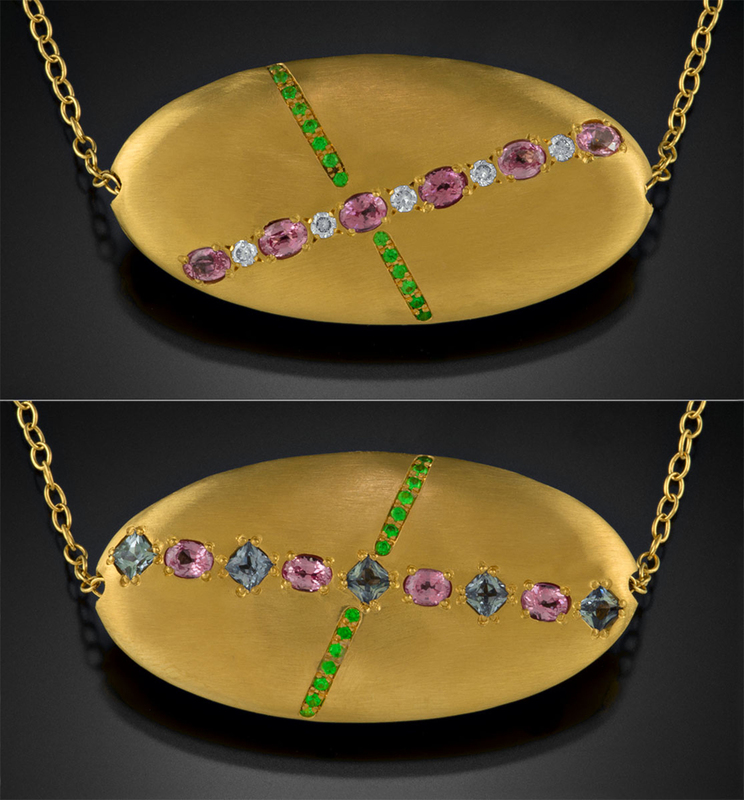 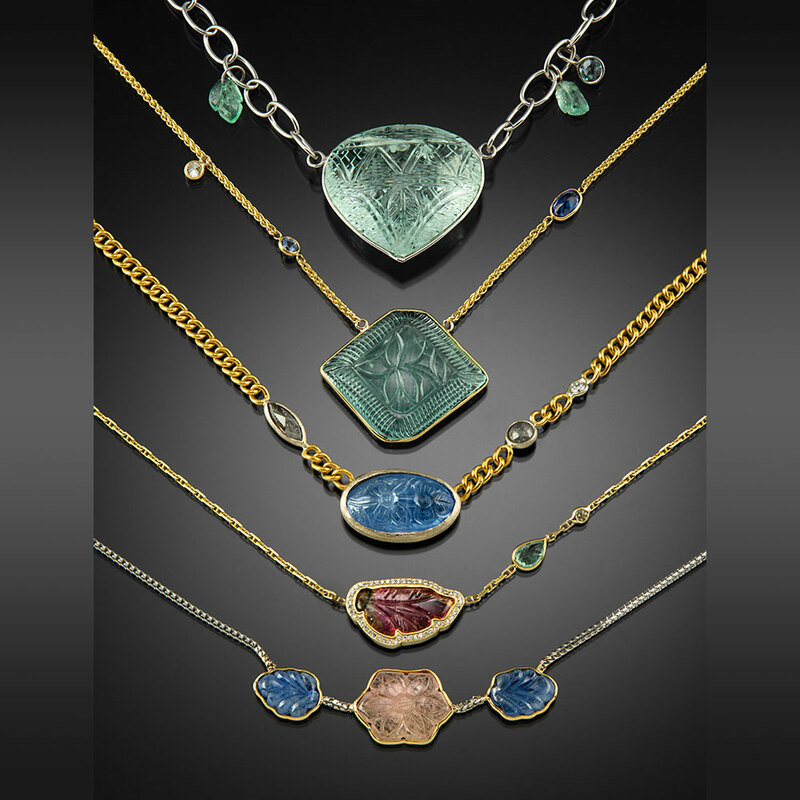 Brushed 18K white and yellow gold necklace with a bezel set light blue star Sapphire and flush set orange, yellow and blue Sapphires, Tsavorite and Demantoid Garnets, and pink Spinels. 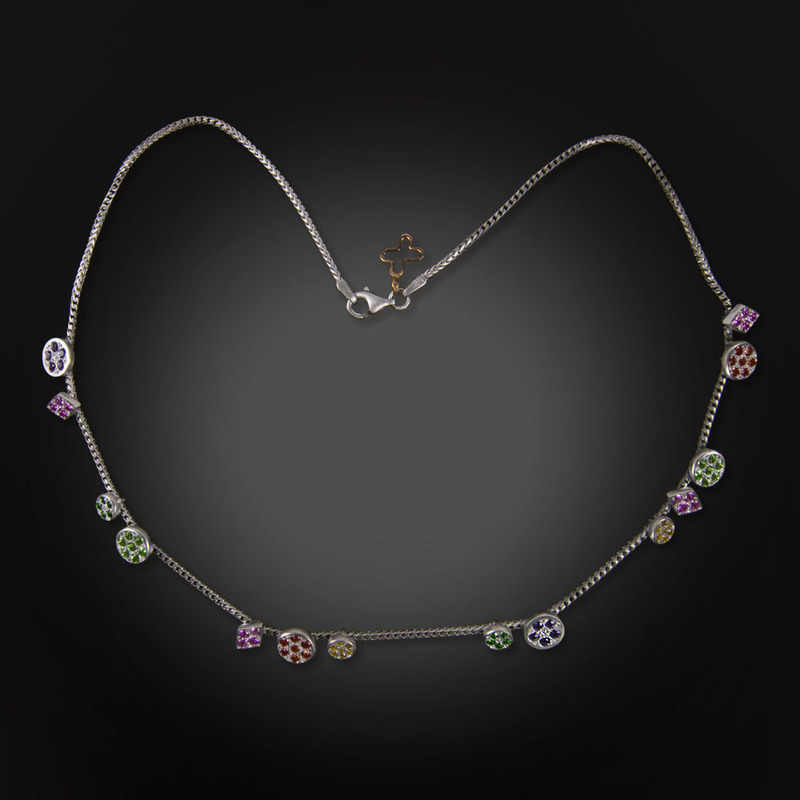 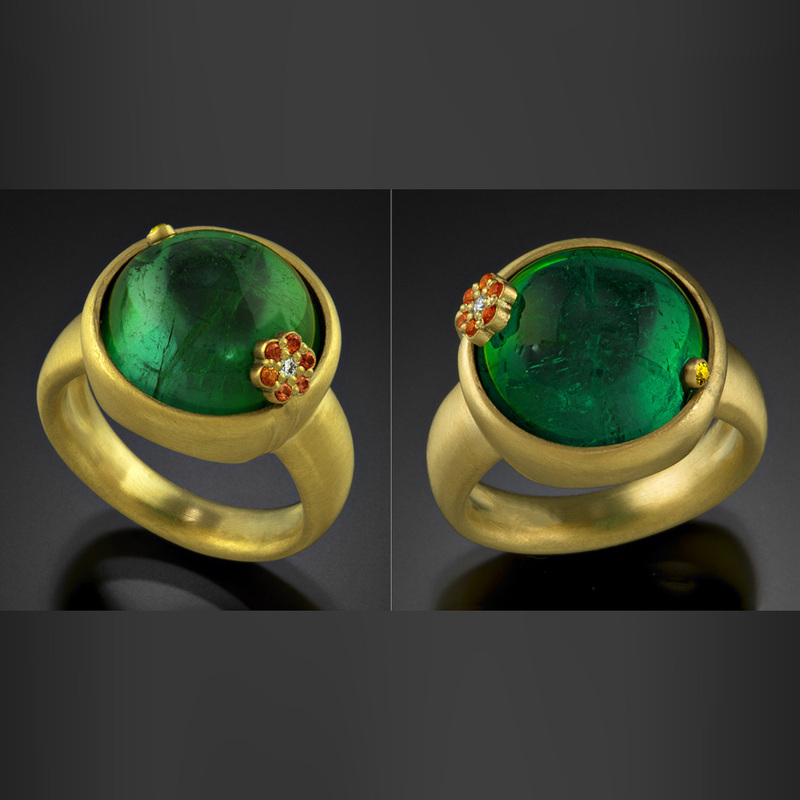 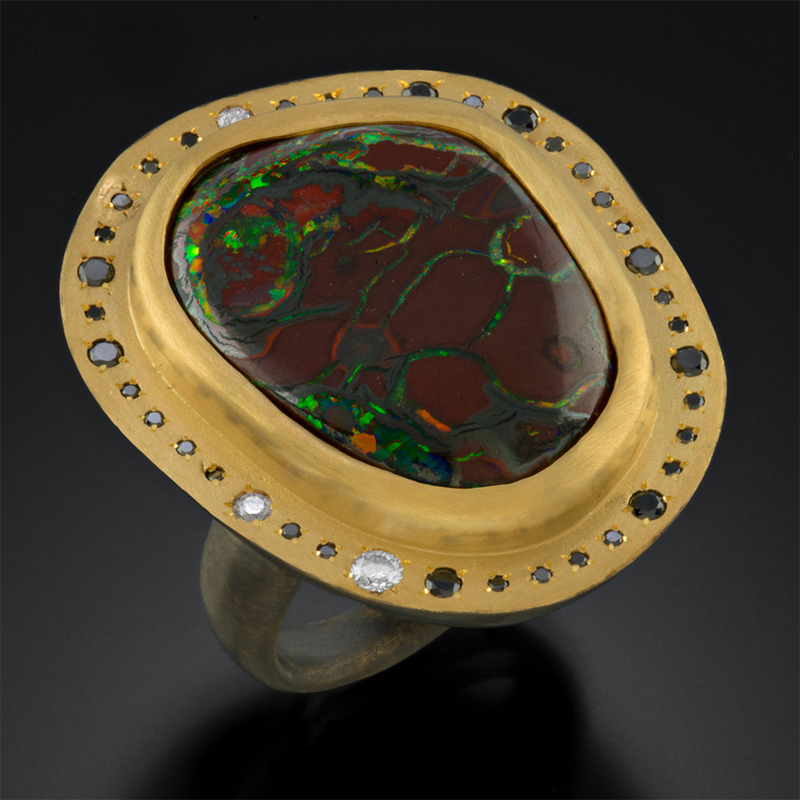 Within the chain is a bezel set Diamond and Demantoid Garnet. 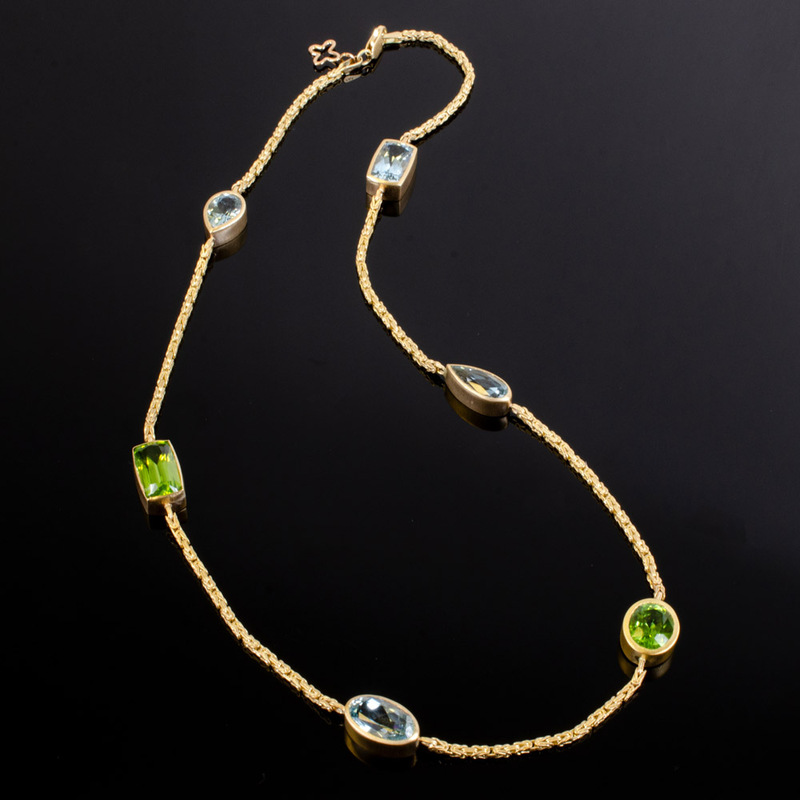 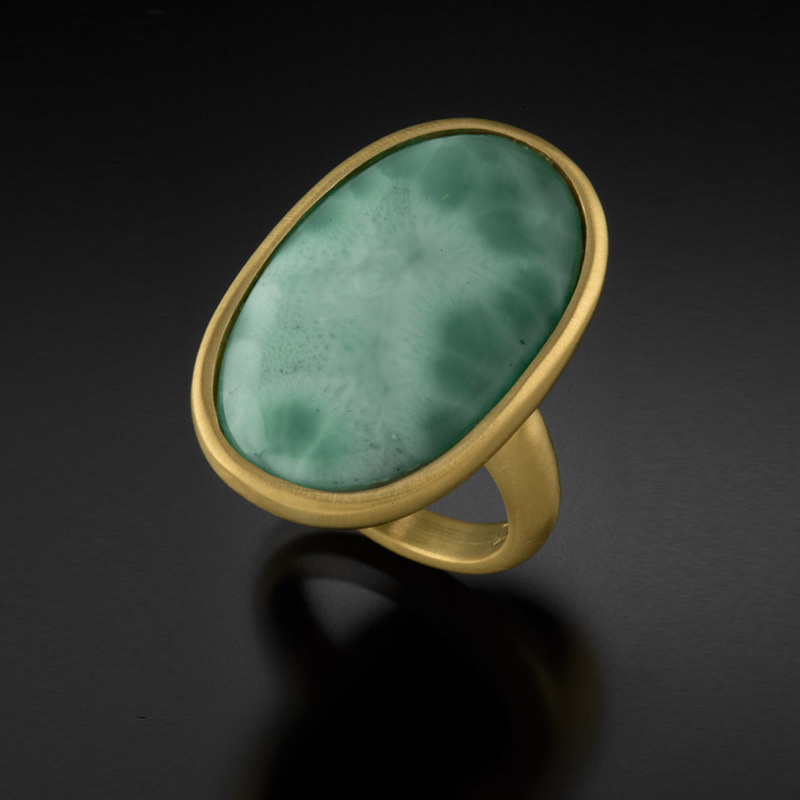 Brushed 18K necklace with bezel set Aquamarines and Peridots. 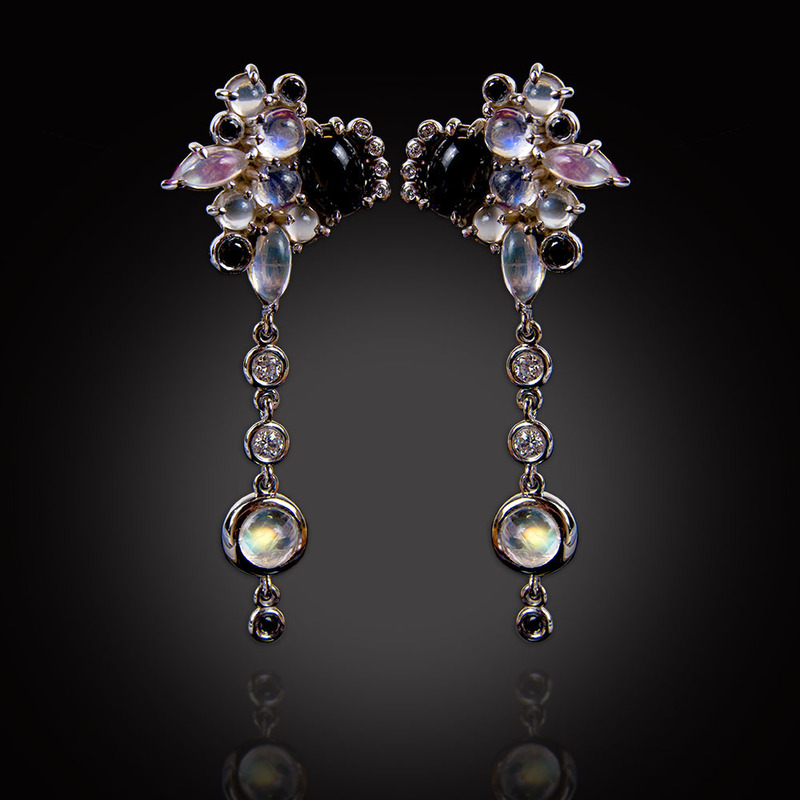 18K white gold dangle earrings with Moonstones, black star Diopside, colorless and black Diamonds. 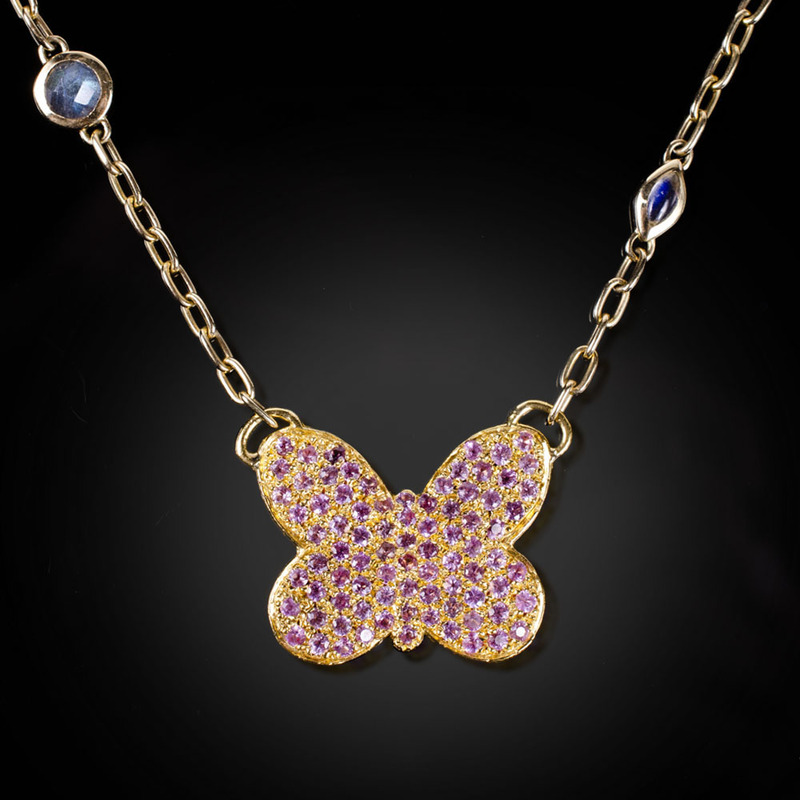 18K yellow gold butterfly necklace with flush set pink Sapphires, Labradorite, moonstones and a yellow Sapphire. 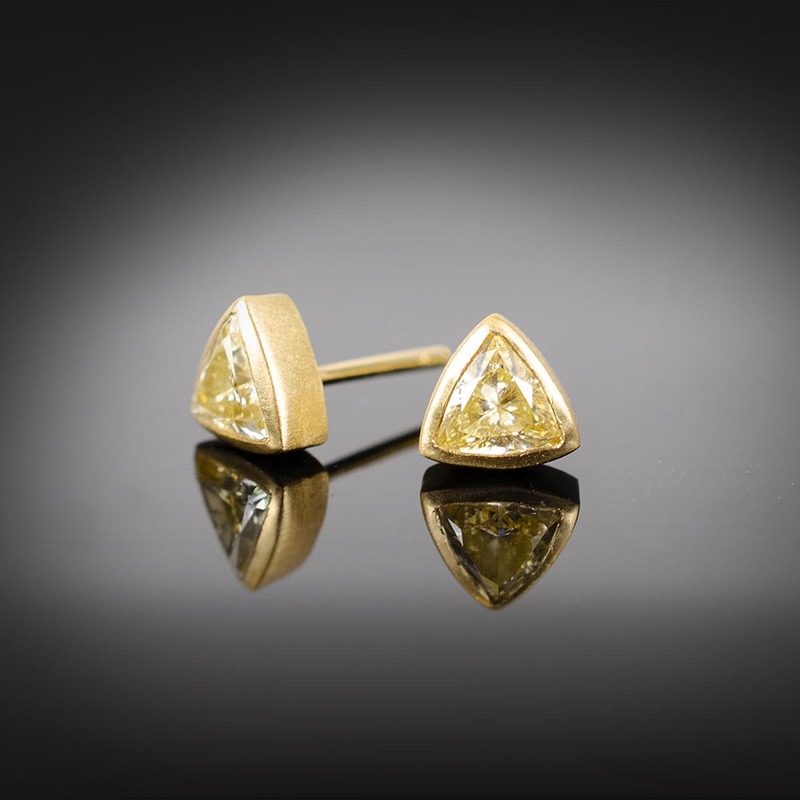 Brushed 18K gold stud earrings with triangular yellow Diamonds. 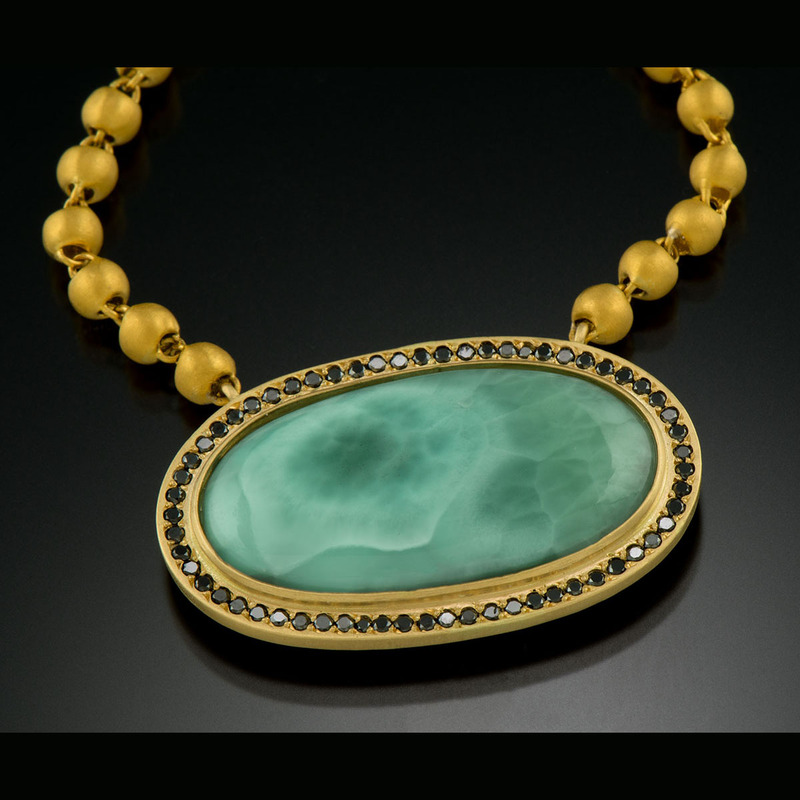 White Gold Boulder Emerald Sapphire Necklace. 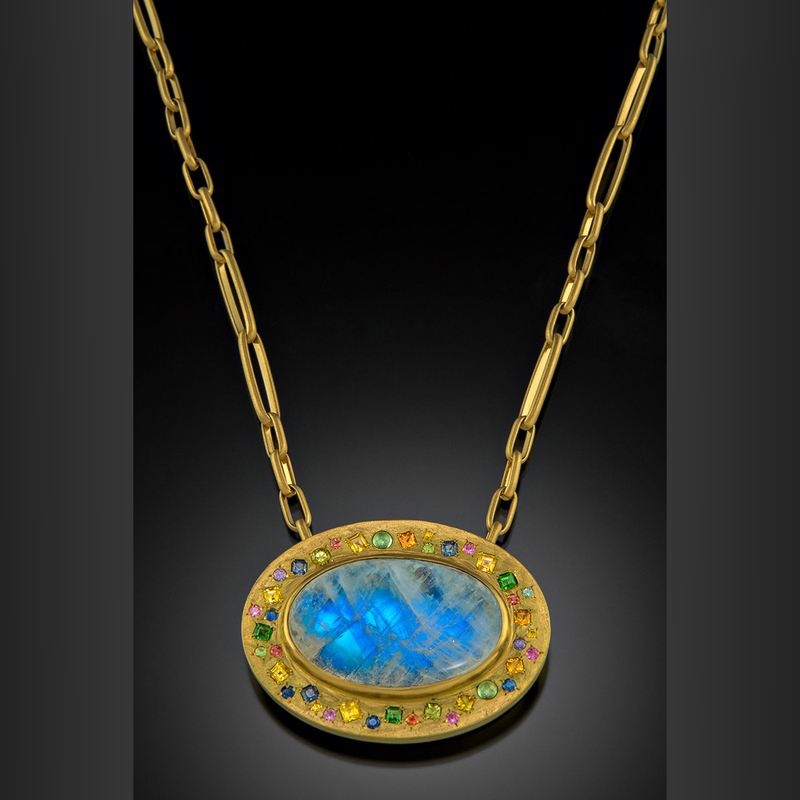 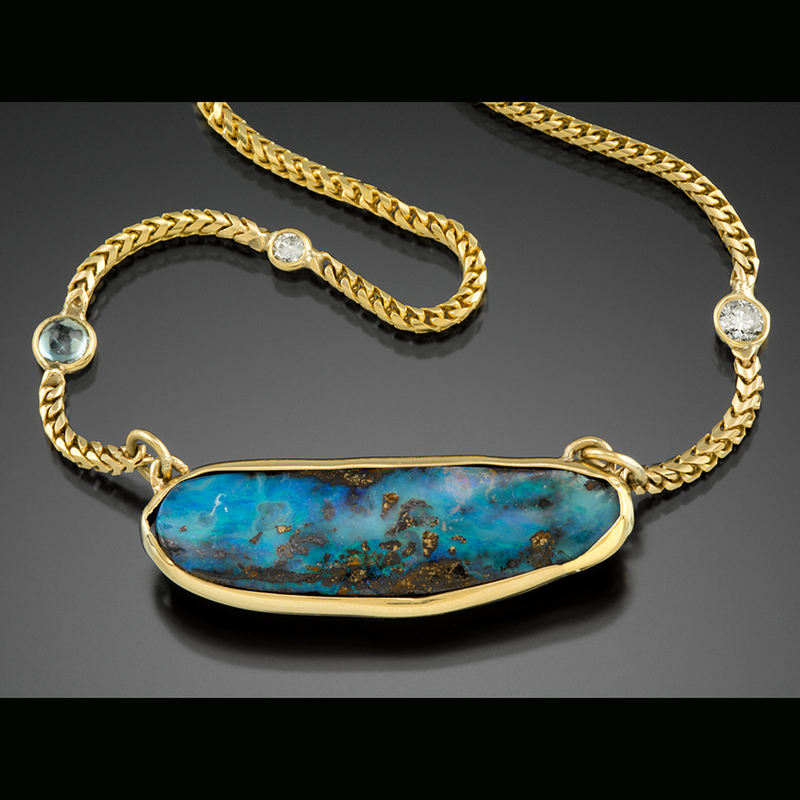 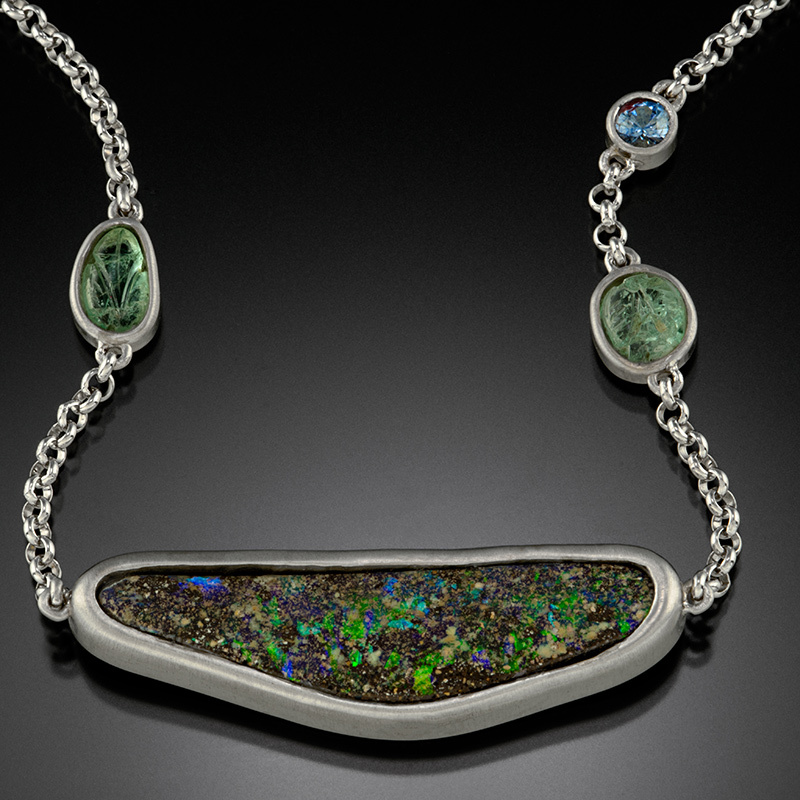 Brushed 18K white gold necklace with bezel set Boulder Opal, carved Emerald leaves, and a light blue Sapphire. 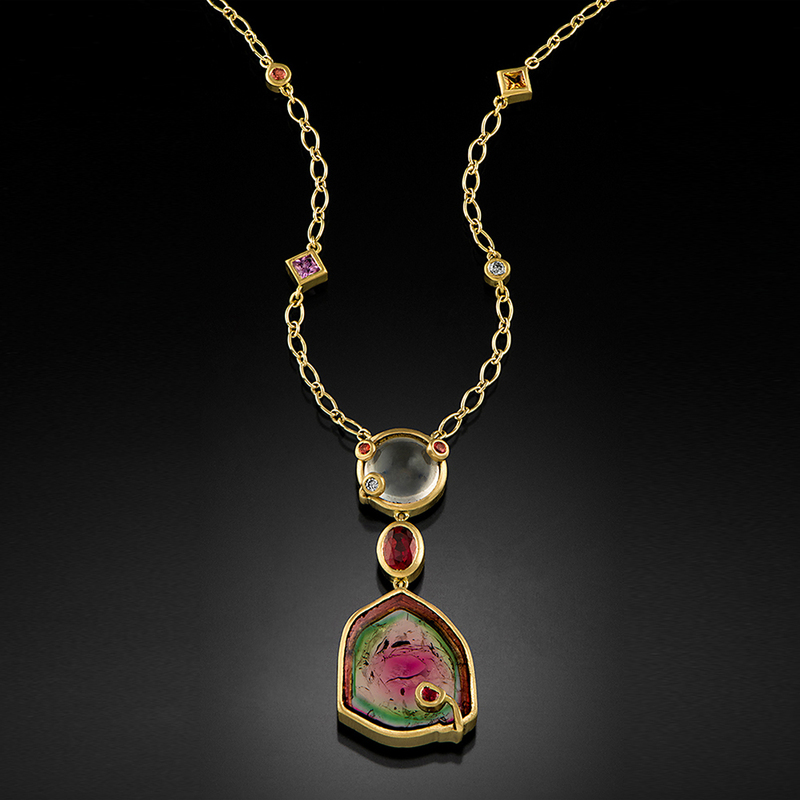 18K brushed yellow gold necklace with a bezel set watermelon Tourmaline (pink Spinel on top), Ruby, and Rose Quartz (orange Sapphires and a Diamond on top). 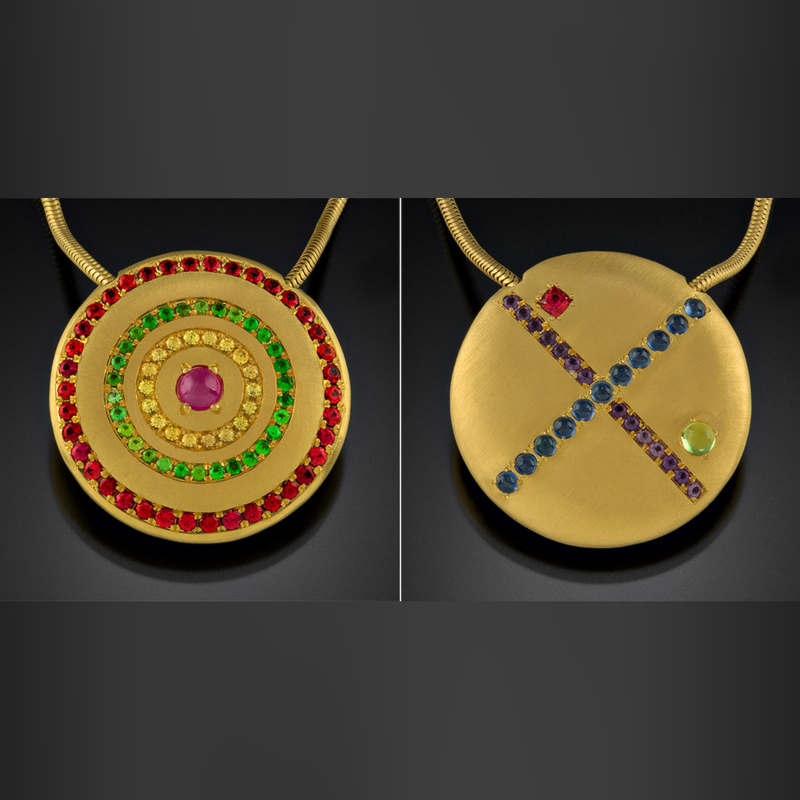 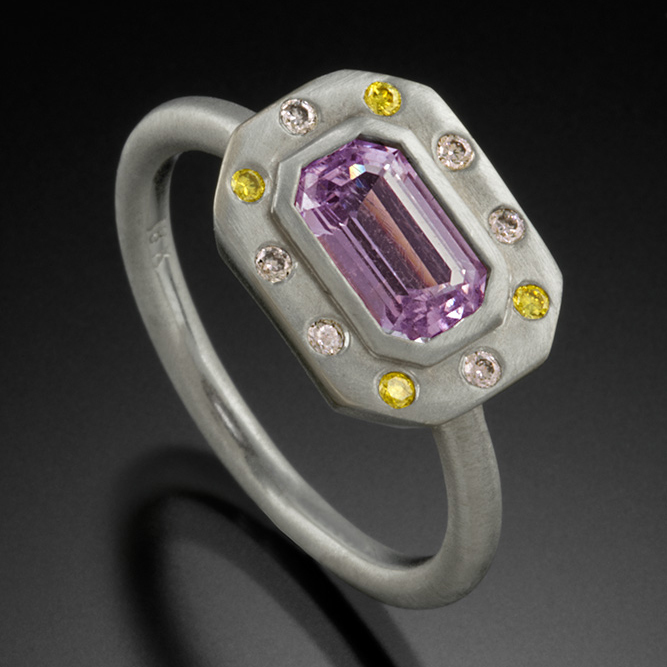 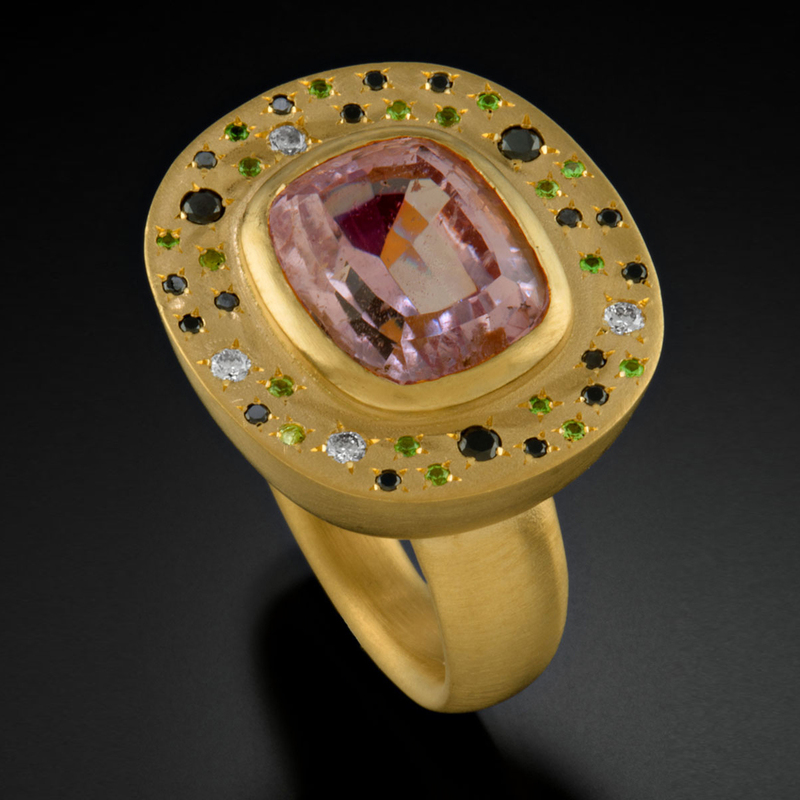 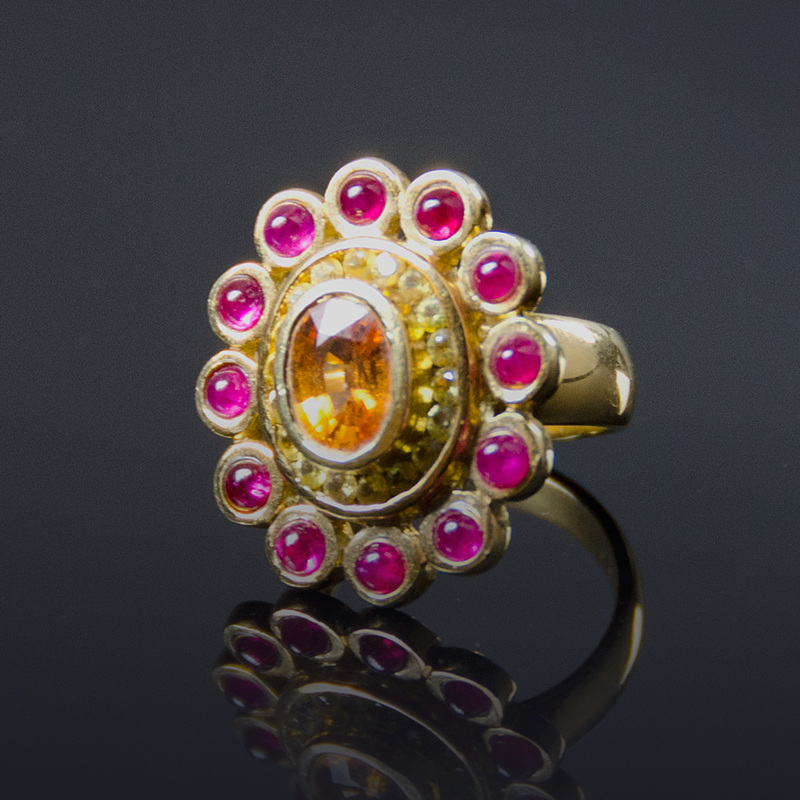 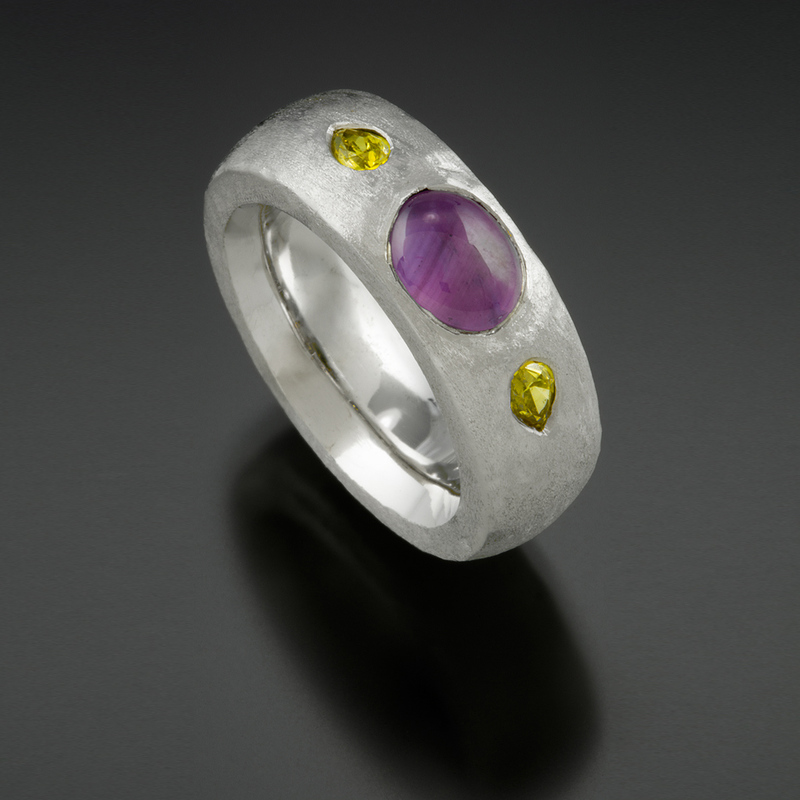 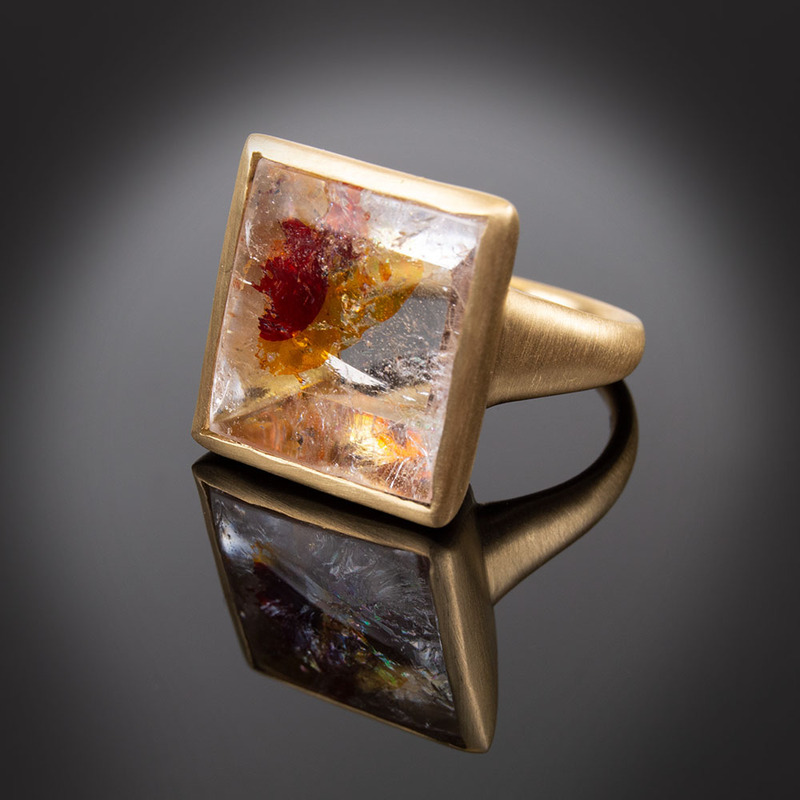 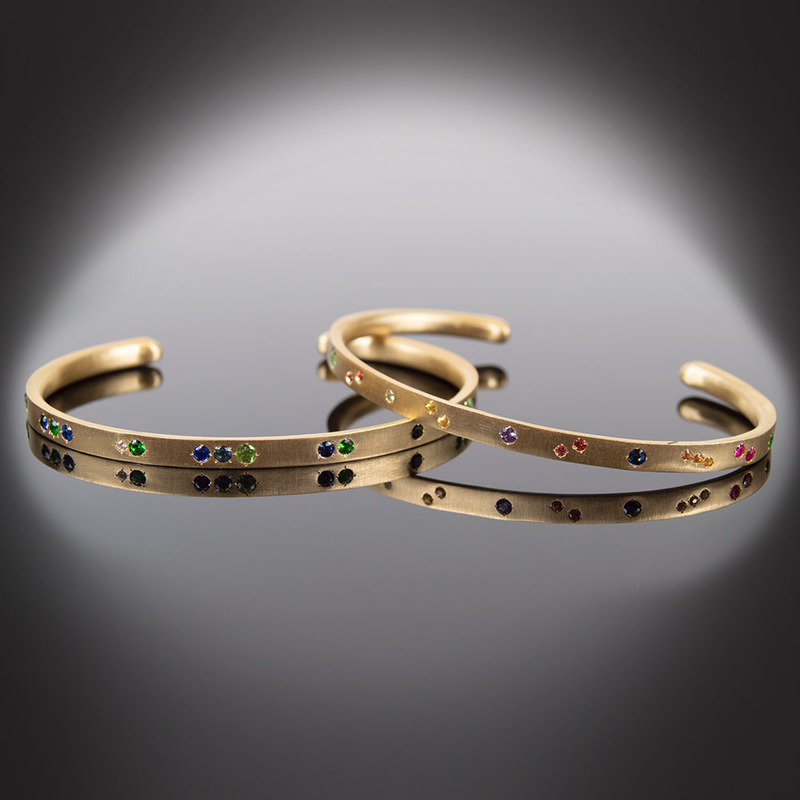 Within the chain are bezel set yellow, orange and pink Sapphires and a Diamond. 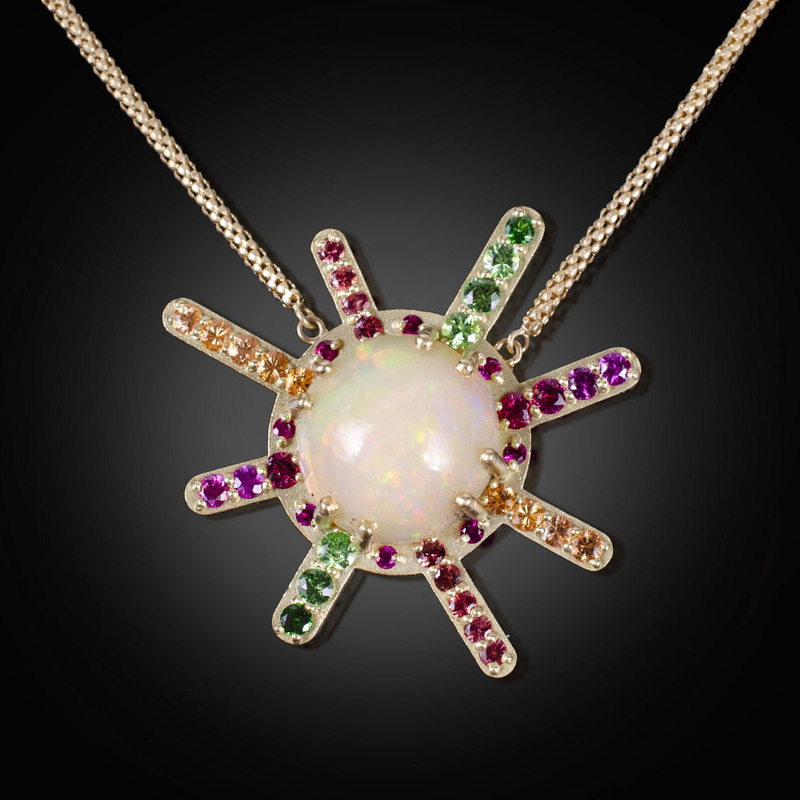 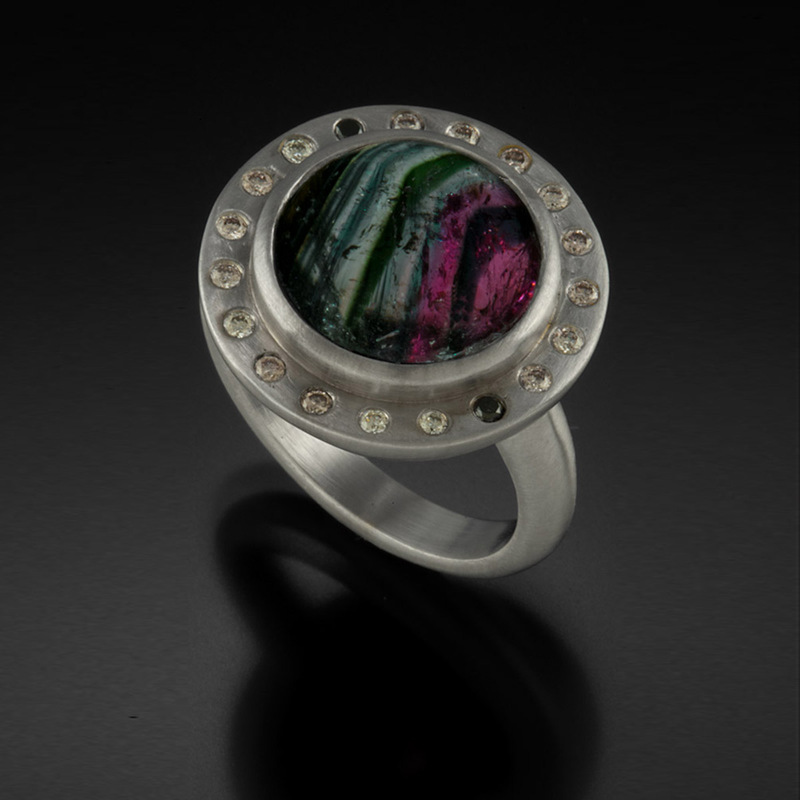 18K brushed Starburst pendant with Ethiopian Opal, Tsavorite and Spessartite Garnets, pink Spinel and orange Sapphires. 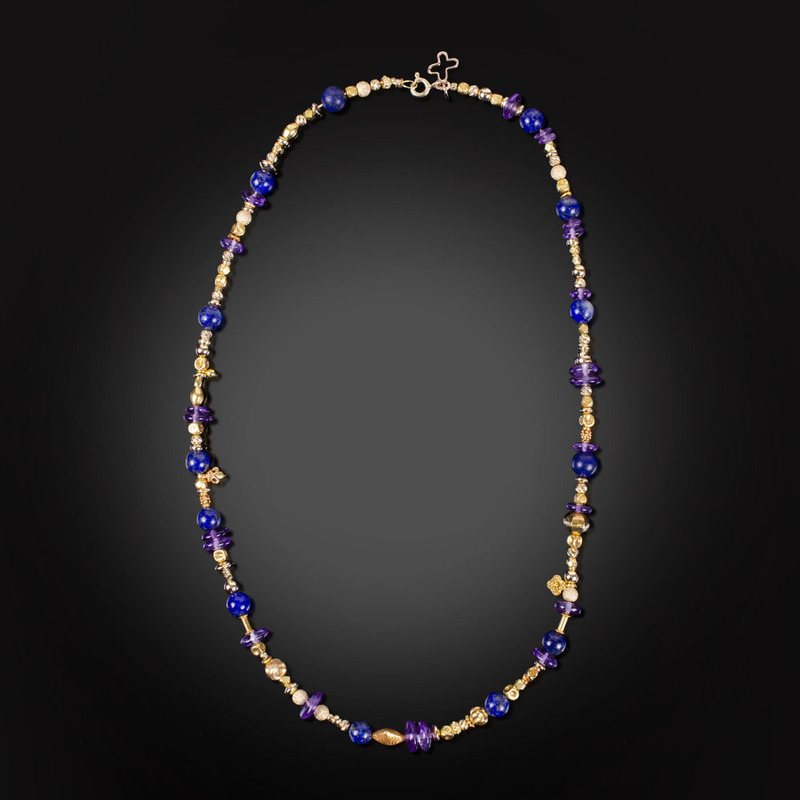 18K yellow gold necklace with blue and yellow Sapphire, red Spinel, and purple and pink Sapphire pave beads. 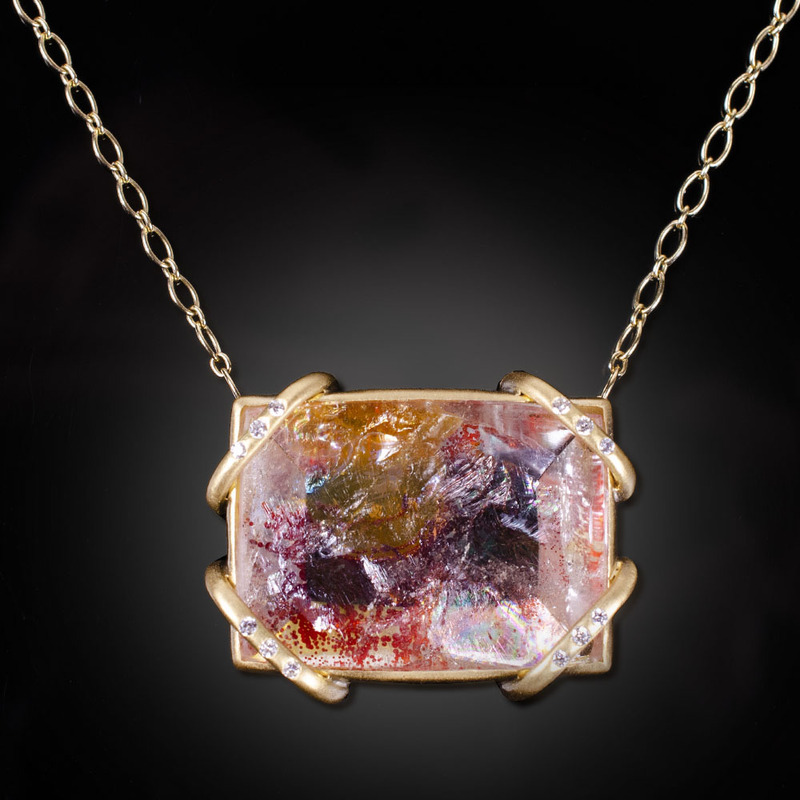 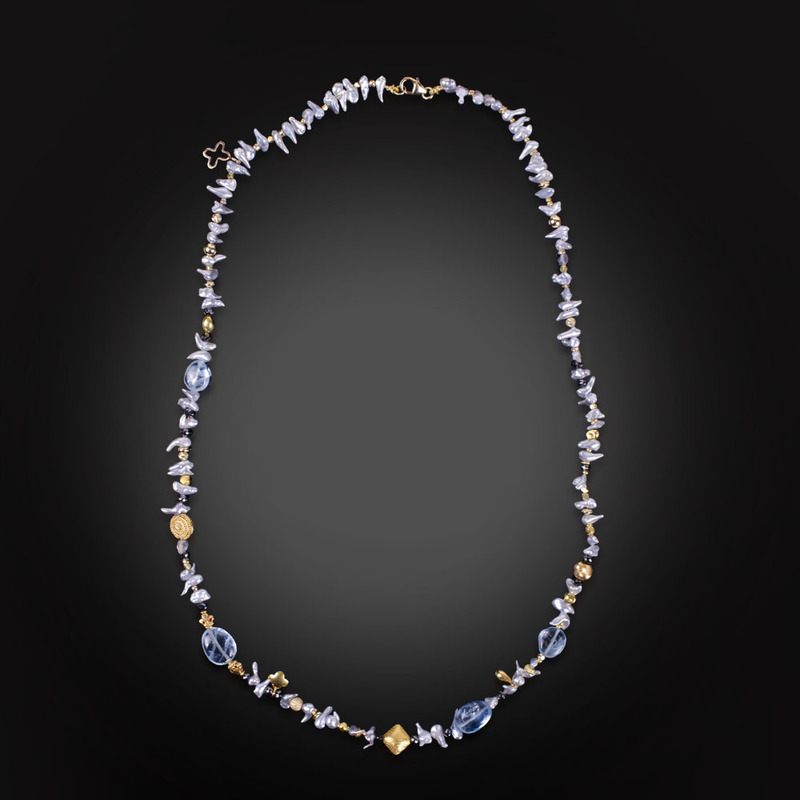 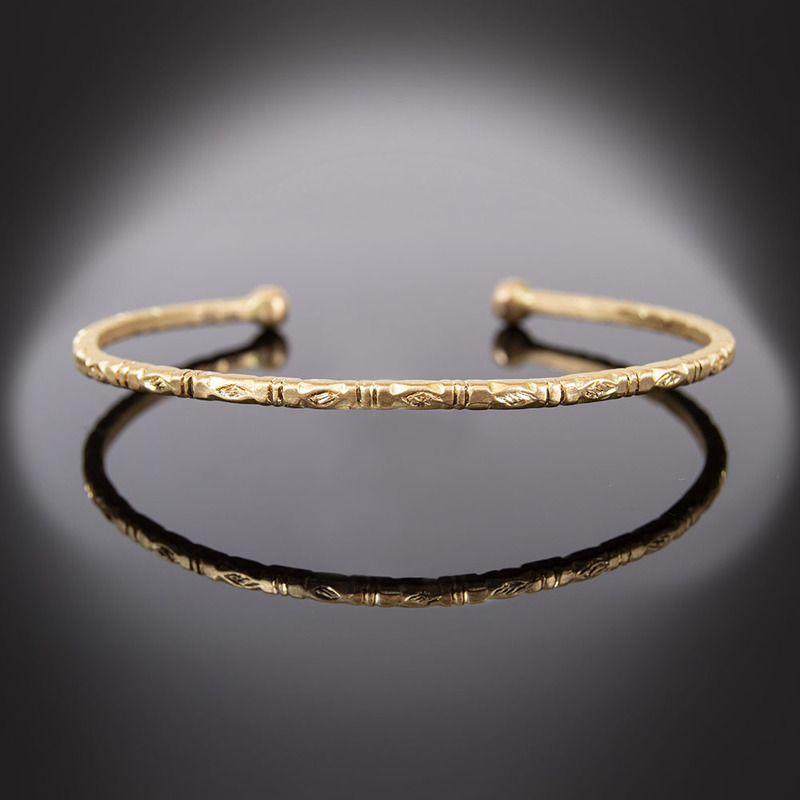 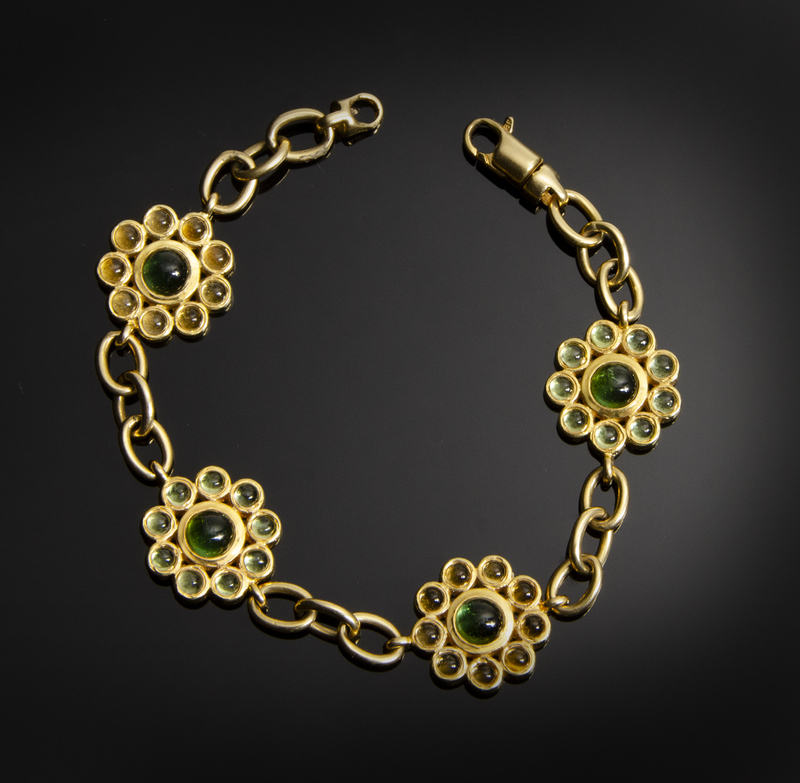 18K brushed yellow gold necklace with Quartz containing Iron Oxide and Diamonds. 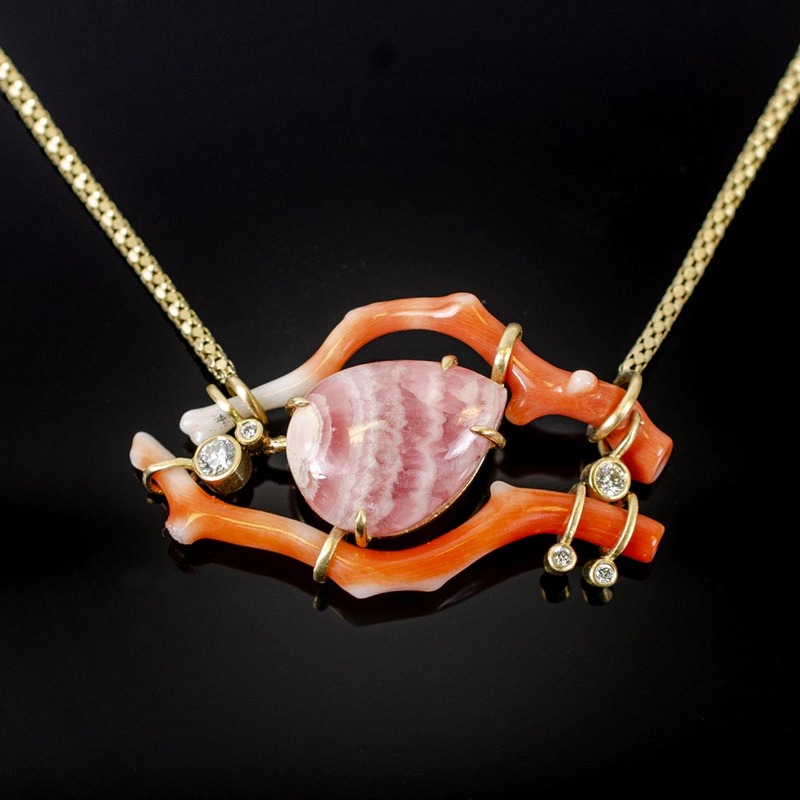 Brushed 18K gold necklace with Coral, Rhodochrosite and Diamonds. 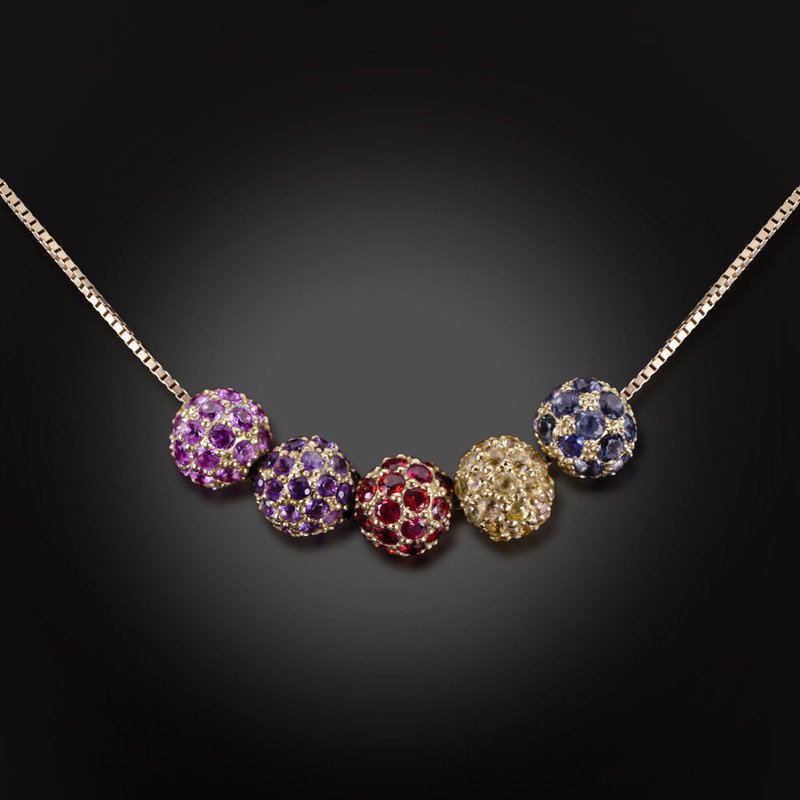 18K yellow gold bead necklace with pave beads of black and colorless Diamonds. 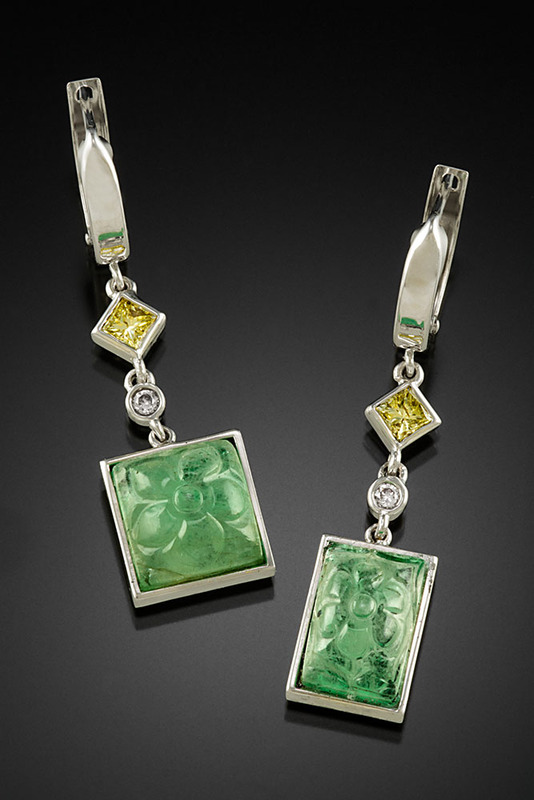 18K white gold dangle earrings with bezel set carved Emeralds, yellow and pink Diamonds. 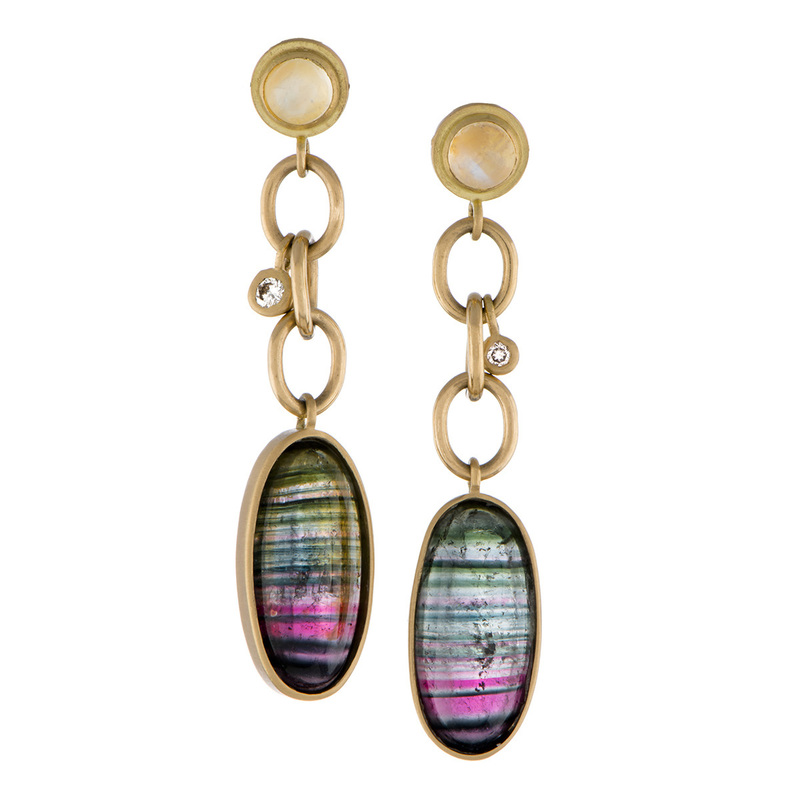 18K brushed dangle earrings with Tourmaline, Moonstone and Dangle Diamonds. 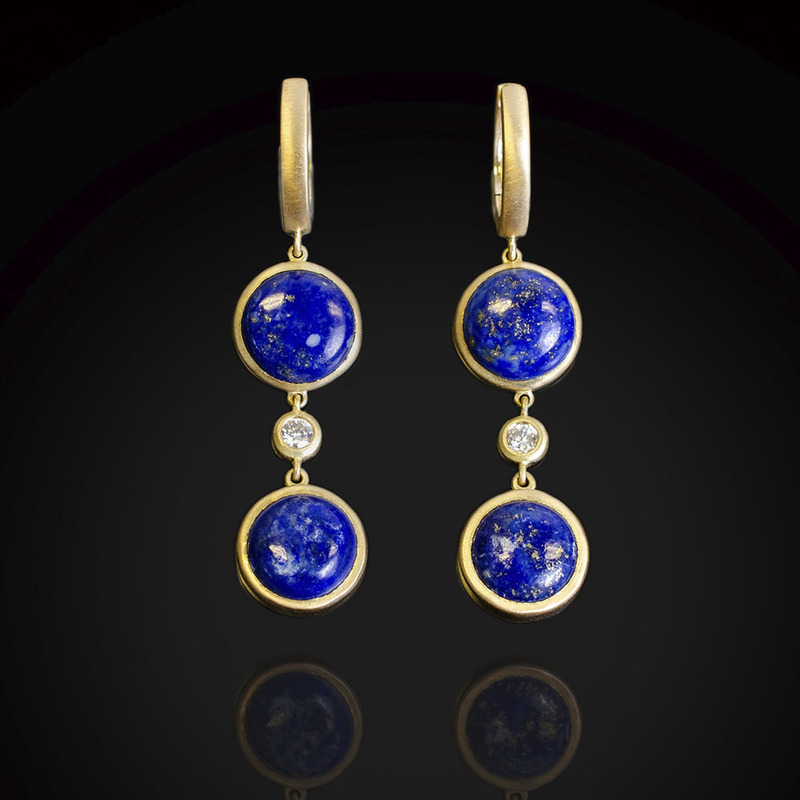 Brushed 18K gold dangle earrings with Lapis and diamonds. 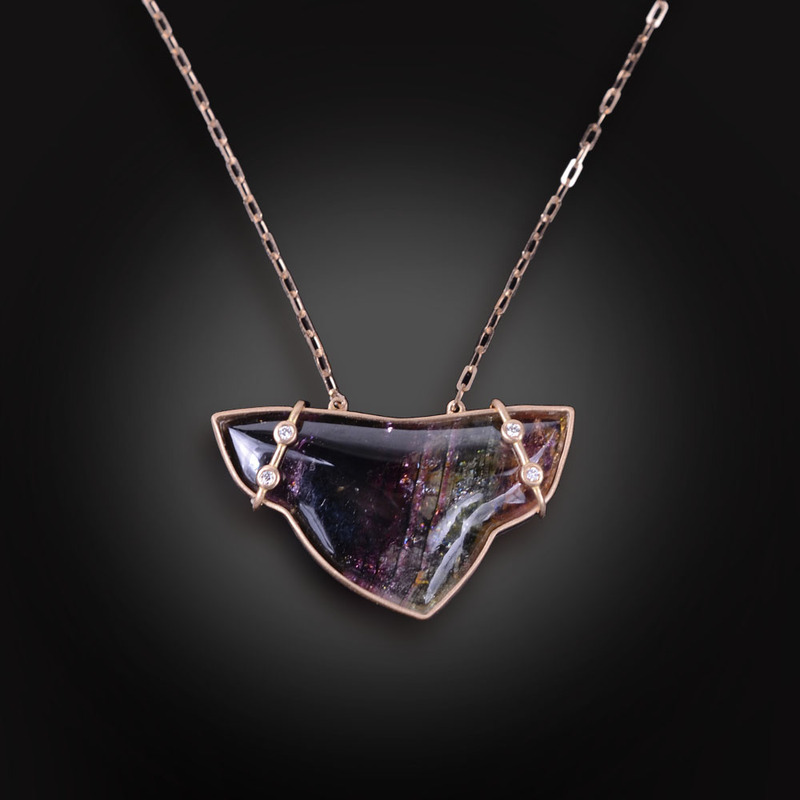 18K brushed rose gold necklace with fancy Tourmaline and Diamonds. 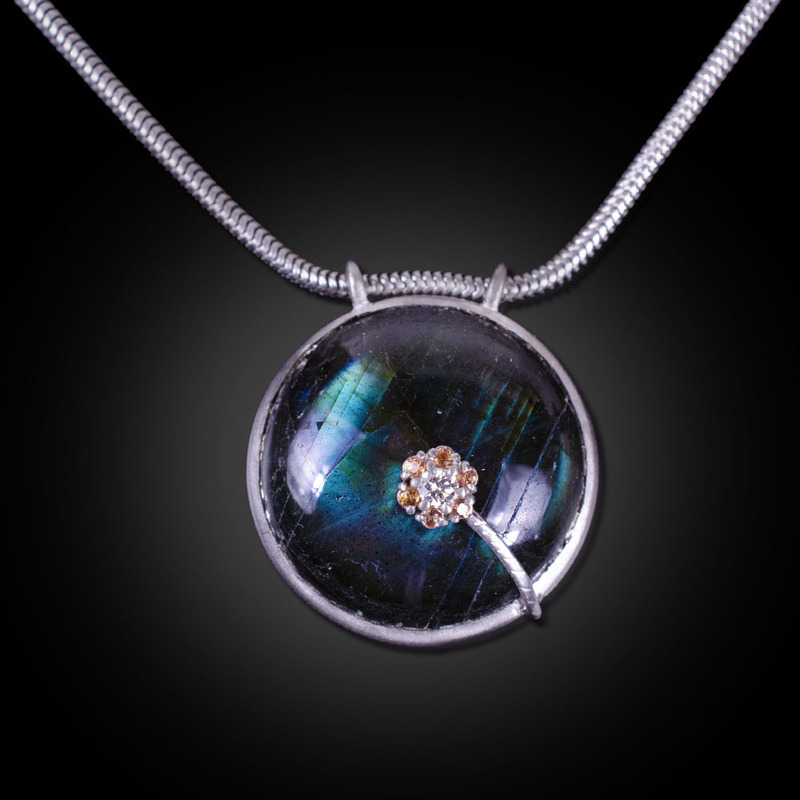 18K brushed white gold necklace with Labradorite, orange Sapphires and a Diamond.